When it comes to exterior styling this is one of the biggest SUVs on the market, it is bigger than almost any vehicle from GM or Ford range and it can only be compared with some really big pick up trucks like GMC Yukon for example. Although being really big and bulky it comes with much less masculinity than some other smaller SUVs, like Chevrolet Tahoe for example. Sequoia has tall belt line, very prominent and maybe little bit over-emphasized grille. It also has chrome mirrors and big door handles, all this makes it look like a real SUV monster. When it comes to interior it is easy to see that its design is directly derived from a Toyota Tundra pickup truck. 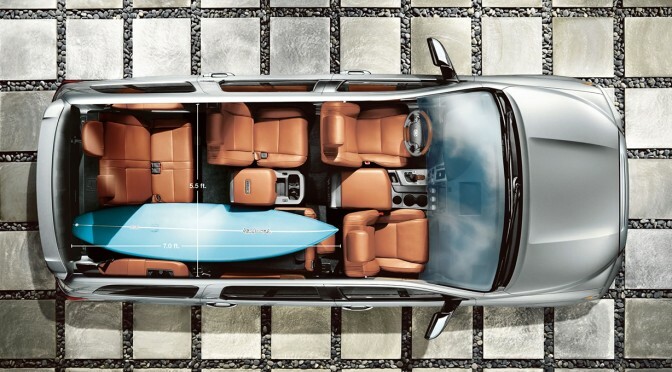 It can fit eight people inside its cabin, same as the much more popular Toyota Highlander model. Highlander although looking much smaller on the outside offers almost the same amount of space inside the cabin. This is one of the reasons this eight seat crossover became so popular and its orders doubled in recent years. This sparkled the rumors about Sequoia’s discontinuation, since both vehicles are made in Princeton, Indiana assembly plant. Sequoia offers comfortable seating, although third row is only good for the kids. Doors are wide and it is easy to approach any of the three rows of seats inside the cabin. Last two rows can be folded almost to the ground, and this offers unbelievably big cargo space. Interior comes with much less luxury than some other vehicles of its class, with much less quality materials used, but it comes with numerous small features that increase the commodity of the interior, such as cup holders. glove box etc. Offer of interior features is much more modest than some other SUVs we saw. You can even give additional $20,000 to give your new Sequoia the finest treatment. Although it sure comes with some modern hi tech like JBL Synthesis sound system, Bluetooth connectivity kit, that includes audio steaming. There is also a rear monitor and DVD navigation touch screen with the Platinum trim level. This model offers engine with a very smooth ride and four wheel drive, but as most of the SUVs of this size it comes with some handling and maneuverability difficulties, which is easily described with its 38-foot turning circle. Four wheel drive comes with some nice extra tech like A Trac active traction control and electronic two speed transfer case which is knob operated from the inside. There is only one engine on the offer, and it is a smooth and responsive 5,7 liter V8. This engine comes with 381 horsepower and 401 pound feet of torque. Sequoia comes with respective towing ability of 7,400 pounds and for an SUV this big it comes with incredibly strong acceleration, it can reach 60 mph in only 6,7 seconds, faster than some sedan vehicles. As we said earlier you can spend additional $20,00 for the Sequoia’s additional equipment, and the base price is definitely not a bargain. Base version MSRP is $44,395.